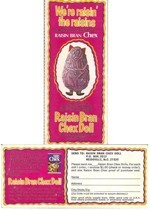 In 1968, Raisin Bran Chex was one of four Chex cereals promoted by Ralston as "bite-size action squares." The other three cereals were Wheat Chex, Rice Chex and Corn Chex. We found suggestions that the cereal was introduced with an ad in which "a woman makes a crunchy noise at breakfast," but we've seen no visual evidence as yet. 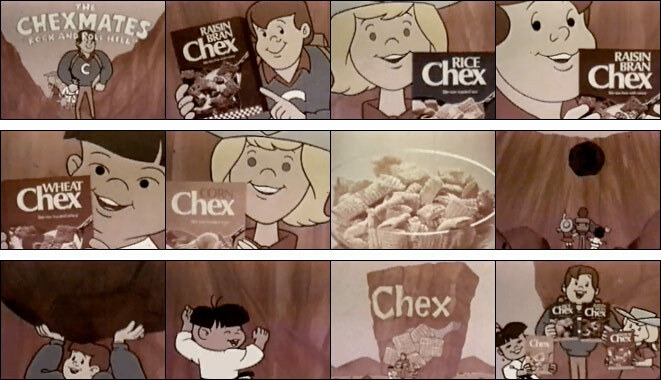 In and around 1968, Ralston's Chex cereals were promoted by a gang of good-doers called The Chexmates. The gang consisted of Chexter, Jessie Jane and Chop Louie. 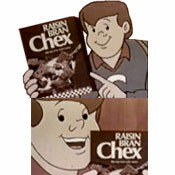 The names of The Chexmates were found at Topher's Breakfast Cereal Character Guide. What do you think of Raisin Bran Chex? 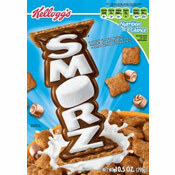 This was basically Wheat Chex with raisins from what I remember.